Everyone has heard the tale for Frankenstein and his monster. The tale has been told and retold for quite some time now. The perspective tends to be from either that of the good doctor or the monster himself. Victor Frankenstein takes a different viewpoint on this old story. The viewpoint that is presented in this retelling is that of Igor. Where in tales prior, Igor is an assistant of little wit or discernment, he is an equal of the good doctor in this movie. Daniel Radcliffe takes up the role of the put upon Igor in this tale of science gone mad. Instead of a creature that is to be ridiculed and maligned we are given a gentle genius that knows no other way to live than to be the whipping boy at the bottom of the ladder in the circus. He is actually a hunchback with no name that tends to the ills of the circus folk as the hospitals of the time are places where people die more likely than recover. It is while Victor is at the Circus to procure animal parts for his experiments that he chances to watch as our nameless hunchback comes to the rescue of his angel on the trapeze after she falls. His reward for saving the damsel’s life? To have his books destroyed and to be locked in a cage like an animal. Victor recognizes the diamond in the rough and returns to the circus to rescue the nascent Igor. This rescue becomes a critical scene which can be seen played out through the rest of the movie. Once the pair are safely ensconced in Frankenstein’s apartments, Victor proceeds to give the hunchback new life. Victor solves the problem of the hunched back and walking on all fours. He acknowledges the intelligence trapped within the dirty shell that had been the hunchback. He shares that if circus had cared they could have freed him of the physical shackles that hampered him. The lightning that starts this new life is a name and a purpose. Victor names him Igor and makes this newly minted man his assistant. I liked the idea of telling the story of Frankenstein from the perspective of Igor. It is an intriguing idea that I hope to see again. The problem with this movie is that it much like the monster that Victor and Igor are creating in the Laboratory. It takes bits and pieces from different genres and attaches them in places where the fit just seems off. An example is the rescue scene. It is a chase scene reminiscent of those found in the new Sherlock Holmes. the requisite horror is there with the creation of the first monster made from animal parts. Stitch on a bit of My Fair Lady and Good Will Hunting and you have the beast that is Victor Frankenstein. Just like the monster, the parts all work together. It is just that some of them work much better than other. The touch of My Fair Lady is nice to see. Watching Igor come into his own through out the movie as well as learning to stand up for himself and learning the difference between allowing himself to be used and making his own choices was excellent. The parts where Victor Frankenstein is a man tortured by his past and seeks to create life to wash away past sins…not so much. 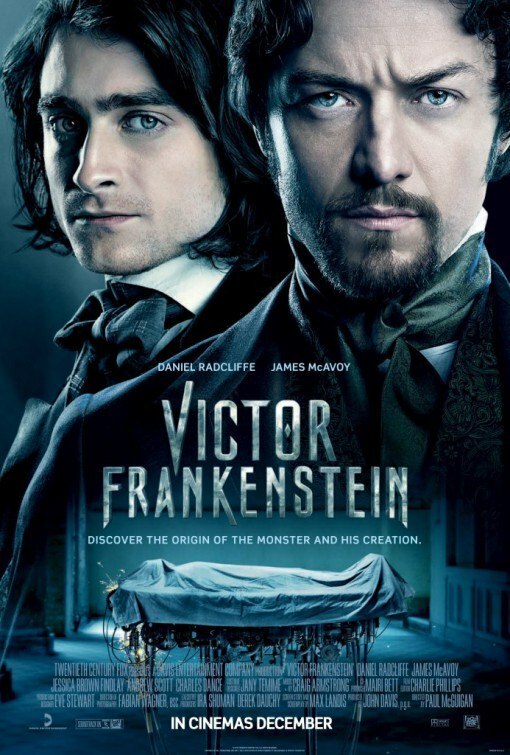 Taken as a whole, Victor Frankenstein is not a bad movie. It has some good ideas about this old story. It just does not execute them well. It is well worth watching as a matinee but not worth seeing at an evening show. I would give it two bear paws out four. Since the release of D&D 5th Edition. The books that have been released for the game have all been adventure oriented. I play D&D which means I enjoy adventures but they are never things that I purchase for a table top role playing game. My interest always lies in setting information. I like more information about the worlds that I play in and mechanics to connect to this information. The first setting book out for 5th edition is the Sword Coast Adventurer’s Guide. This is a book that is a primer for the Forgotten Realms in this new edition Dungeons and Dragons. If you are new to the game, The Forgotten Realms have been around for a very long time. The setting started as the home campaign for Ed Greenwood. The world migrated from the table top to the page and has been a staple of the game for some twenty years or more. 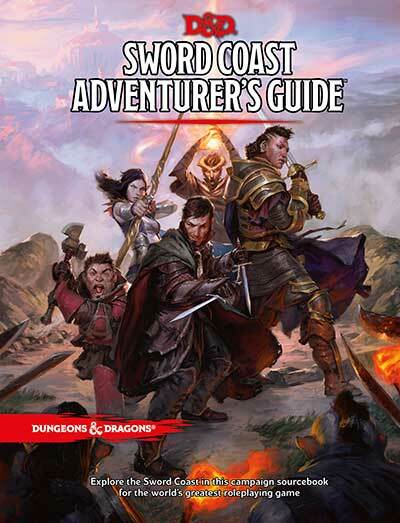 The Sword Coast Adventurer’s Guide is a thin hard back tome tipping the page count at 160 pages including index and an advertisement. The book retails at $39.95. The things that was a pleasant surprise to me about this book from a production stand point is that it was a collaboration between Wizards of the Coast and Green Ronin Publishing. I am a fan of Mutants and Masterminds and Kickstarted the new edition of Blue Rose. Seeing that Steve Kenson and the gang had a hand in the making of this book made me happy I had picked it up. As I mentioned earlier. This is very much a primer for those not steeped in Forgotten Realms Lore. It provides a nice jumping off point for those interested in the setting without overwhelming them with breadth and depth of the canon of the setting. I myself had not kept up with the changes that occurred with the Realm’s timeline in the changeover from third edition to fourth and now this fifth edition of D&D. In the first few pages, this book gave me a nice overview of the spell plague, the sundering, the death and rebirth of gods that I had always licked and the return of gods that had perished during the time of Troubles. Not bad for the first 17 or so pages of the book. The one thing I enjoy about any medieval setting I play in , is the gods that populate the realm. As the Forgotten Realms was the first setting in which I played and read the books, the pantheon of gods to be found here are near and dear to my heart. To cover all the gods in this tome would have been impossible at the current page count. The authors of the book do a good job of providing an introduction to each of gods of note as well as listing the gods of the demi-humans for reference. I found this useful from a veterans perspective as well as it gave me insight into how some of these gods had changed with all the momentous changes that had occurred in the setting over the past few years. The meat of the book is a gazetteer style discussion of some of the regions of the realms with a focus on the Swords Coast region. The discussions of Zhentarim was particularly edifying. I enjoyed how the authors gave a nice description of how this organization collapsed and then reinvented itself in these new times without losing the feeling of an impending threat despite the thin veneer of new civility. The book even gives a nice introduction to the Underdark and Menzoberranzan. The book also provides some nice additions for the players in the Forgotten Realms. It provides information in regards to building characters using the dark dwarves and deep gnomes. In additon, it provides new character options in the forms of different paths for some classes, explanation of how some paths are viewed in the Forgotten Realms. The book also adds in new backgrounds to help players create characters more connected to the setting. My favorite was the Arcane domain for clerics. I always enjoyed playing a cleric of Mystra and this new edition of the game lacked the feel of that type of character. This new domain changes this and makes it so I am looking forward to playing a cleric soon. The art in the books is fantastic. The pieces range from small symbols of the gods to full page action pieces at the start of new chapters. The styles used throughout varies but does an excellent job of capturing the feel of the Realms. The book itself fits well with the main books on the shelf and is made of sturdy stuff that should handle hard usage well. My only problem is that I wanted more information. As an introduction to the Realms, this book could have easily been over 200 pages. I would not have minded a price point more in-line with the core books if it had included more information. I understand that I can expect more such books which goes to great lengths to ease my suffering. I would give this book three bear paws out of four. It has good art, great information and high production values. It is a thin volume for the price point which is the only thing that keeps it from being a four bear paw book. It is still a great addition to your D&D library and excellent starting point to learn about the Forgotten Realms. To be 100% transparent, this is the second X-Men title that I have read this year. 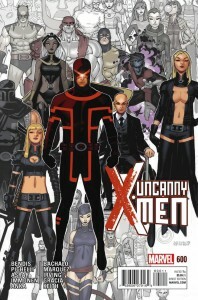 The first was the All New X-Men where the Iceman story line which I was following. In the earlier book, Iceman was outed by his friend and teammate, Jean Gray. 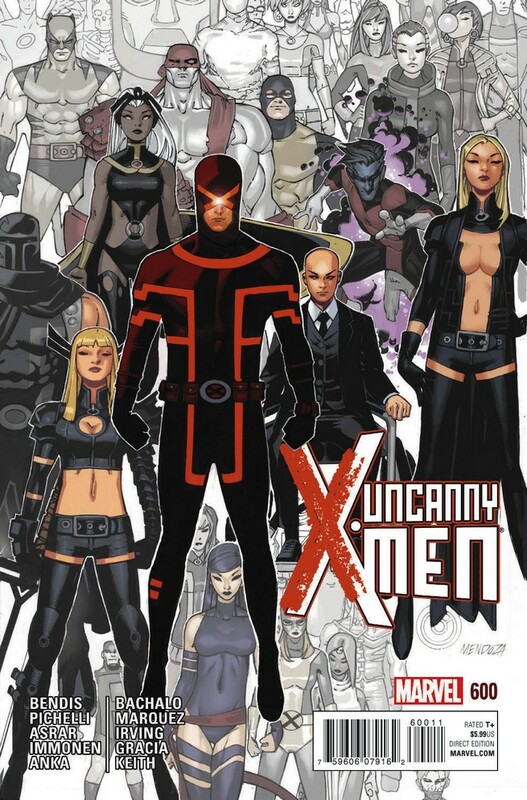 For those unfamiliar with the X-Men in general and this current story line allow me to provide some knowledge. The current story unfolding in X-Men has Beast traveling through time and bringing the young X-Men from the past to the future in the hopes that they can help stop events from turning out so horrible. In the process of doing this, these younger versions of the X-Men are confronted with what they will become as they grow up as well as become stranded here in the present. This younger Jean Gray is a telepath of considerable power. During some down time, she pulls Iceman aside after he awkwardly comments on how Majik is hot. Jean asks Bobby why he did this when he is gay. Iceman’s response is predictable, if somewhat quick to adapt to his new circumstance. This raises the question, what about the older Iceman? Now, the story line in Uncanny X-men isn’t just about Iceman. This book starts off addressing the many inappropriate things that Beast has done since bringing the young X-Men forward in time and stranding them. Storm and the rest confront Beast on his inability to ever consult with anyone over his plans and then leaving the considerable mess to be dealt with by others. As this story unfolds, there are flashbacks to moments before the intervention begins. The reader is treated to the various members of this rag tag band of mutants having quiet moments of reflection and decisions. One such moment is when the young Bobby Drake confronts his older self about his sexuality. Older Iceman laments that it was difficult just facing the ridicule and hatred of being a mutant why would he have added an extra heaping of hate onto his life. He goes on to say that it was easier to focus on the team and being the best X-Man he could be and sublimating. Jean brings up that if he had been truthful with himself and others, he might have been an even better X-Man. Whether Older Iceman comes out to others, remains a question to be answered. I enjoyed how this portion of the story was handled. It was more honest that I would have expected from an X-Men book. The rest of the story was also intriguing. I want to know what happens now that Cyclops has appeared on the steps of the White house after having gathered all the mutants together there. I want to know what happens as Beast runs away from being a responsible adult. Also, the art in this issue was gorgeous! There were so many great artist on the book that this was a guaranteed home run art-wise. MY only problem with the book is that the women characters are once still being drawn in costumes that are ridiculous. It seems that we can not get away from this treatment of the female heroes in most comic books. Sigh. I would give this issue of Uncanny X-Men three bear paws out of four. It tells a good but complicated story about coming out to oneself in a unique fashion. It also tells the story with a bit of candor that I did not expect from a comic book. The art is fantastic and the larger story is interesting as well. Well worth picking up if you missed it last week. I have enjoyed the new reboot of James Bond. Daniel Craig has brought a different feel to the role which was welcome change to the campiness that had been a hallmark of the franchise originally. I was excited to see this last iteration of Daniel Craig’s bond. It isn’t that it wasn’t entertaining, It was. It was that the movie ran for a long time and at no point are there any twists or turns that don’t follow the script from the earlier years of Bond. The story of Spectre picks up a short amount of time after Skyfall. Bond is walking through a Day of the Dead parade with a beautiful woman as is to be expected. He takes her to a hotel to leave her and begin his search for his actual target. Bond tracks the Man in White to a meeting where he learns more about the sinister organization, Specter and it’s Pale King. Bond fails to kill his target which leads to a chase of escalating audacity. The chase climaxes with a fight in a helicopter that is crashing before Bond is able to eliminate his target, land the helicopter, and return to the woman he left behind. Cue the musical montage intro! The problem for me was that this whole chase scene felt like it was just a place holder as the outcome was a forgone conclusion. In the previous movies we are given similar scenes and enough information is given to set up the feeling that there is something at stake in this chase. This is not the case for this chase scene nor any part of the movie. The collateral damage makes international news and kicks the hornet’s nest which is the British Intelligence Service in the wake of Skyfall. M has a new boss that does not believe in the 00 project and is working to shut it down. Bond’s activities provide him the ammunition that he needs to go before the Home Secretary and do just that. 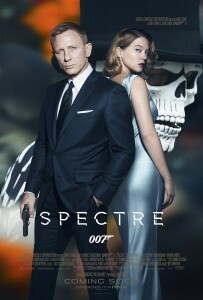 Thus begins Bond’s hunt for Spectre while working to avoid the prying eyes of his own employer. The thing is, as soon as the new boss shows up on the screen, you know he is one of the bad guys. It is not explicitly stated but move is so telegraphed that you don’t need Bond to connect the dots for you to know where the bread crumb trail leads. I think the most disappointing thing for me was the reveal of the pale king and why he did what he did. The Bond movies staring Daniel Craig have done a good job of dropping in bits about his past. The idea that he was an orphan and taken in by another family that has been built up across several movies has been intriguing. It turns out the Pale King has known about James all along. When James was an orphan, his father took James in. His father took great care of James and the Pale King felt as if he was pushed aside. He uses the analogy of the cuckoo bird in regards to Bond throughout the movie. The twist that the head of Specter is responsible for the deaths of all the women that Bond has became attached to is anti-climactic. the reasoning behind it falls squarely into the arena of daddy issues. In the villain’s eyes. Bond had stolen his father. Now, he would take anything that Bond ever cherished, even to the point of damaging his brain so that he couldn’t remember his newest paramour. This information is both too little and too late. It just feels weak that all the pain that Bond has suffered is due to some possible imagined sleight that wasn’t his fault and he can not remember. On the plus side, Spectre is visually gorgeous. There are shots scattered throughout the film that are conjure up the feel of the older Bond movies. In particular, there is the scene on a train where Bond and Madeleine are having dinner. Despite the modern era, it had the feel of 1940’s noir film. When the assassin attacks, the feeling of an older Bond film is then added in. I enjoyed how this switch of genres was pulled off. The use of a white cat as the pale king began his elaborate death trap was a rather nice image as well. Overall, I was unimpressed with spectre. It was entertaining but lacked the emotional connection that was present in the previous Bond movies. It worth seeing at a matinee showing but I would pass up paying full evening prices for Spectre. I give Spectre one bear paw out of four. With the release of the new Star Wars movie not far off, my interest in Star Wars has been renewed. 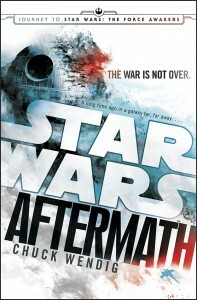 I had not read a Star Wars Novel in many years but the recent Kerfuffle on the internet in regards to Star Wars: Aftermath drew my attention. Hearing the complaint that LGBT characters had been included in the story and they were running the universe made me pick up the book because I am always looking for books that are inclusive. Aftermath is the first book in a trilogy exploring the Star Wars Universe between the end of Return of the Jedi and the Beginning of the Force Awakens. The book opens with the only well known character from the original movies who makes more than cursory appearance, Wedge Antilles. Wedge is out on a scouting mission looking for Imperial Activity in the outer rim to ensure that there are not plots afoot. The New republic has created this mission to continue making good use of Wedge’s piloting skills and to allay his fears of missing something that a large fleet might miss. Wedge discovers a gathering of Star Destroyers in the space above Akiva. Before he is able to report his findings back to the New Republic, Wedge is Captured. On the Surface of Akiva, Norah Wexley , a pilot that flew in the destruction of the last death star is attempting to find her son whom she left behind to join the rebellion. Norah hears the last message of Wedge before his signal is lost and this knowledge haunts her as she searches for her son and a way off planet. Add in to this mix the bounty hunter Jaz, a dissolute Imperial Loyalty Officer Sinjir, a genius programmer teenager, Temmin, and a crazed battle droid called Mr. bones and you have the makings a of a quintessential Star Wars story. I started reading the book with low expectations. The last Star Wars novel I read was the Courtship of Princess Leia and it left me feeling cold towards the novels. This books was surprisingly good. Wendig does and excellent job of hitting all the tropes of Star Wars while incorporating some of the harsh realities that are glossed over in the movies from both sides. From the perspective of the New Republic, the reader is given a glimpse into the post traumatic stress that Norah suffers from her time at the battle of Endor. A direct comparison is given later in the book for the Imperial pilot attempting to get Admiral Sloan to safety as the New Republic begins their attack on the meeting. In particular, Wendig talks about the nervousness both felt before missions and how it had to be handled by each due to the cultures of their leaders. I also like that throughout the book the choices that each character made that brought them to this place and time are picked up and turned over so that the reader and the character both come to the same conclusions about why they are where there are now. It is was nice to find this type of depth in a Star Wars novel. Lest I forget, my initial reason for picking up the the book was the uproar in regards to Wendig having LGBT characters in the book. This is no simple token gay character but actually adding these characters as if they are a natural part of the universe which was delightful to see in a Star Wars novel. One of the places they crop up is in relation to Temmin. When Norah left to join the rebellion, She left him in the care of her sister and her wife. It is just put out there with no preamble and treated as normal part of life. This inclusion isn’t just left to background characters. one of the major characters of the book is also LGBT and Wendig handles both the characters interactions with others as well as their coming out to the other characters with aplomb. It made my heart swell to see this happen in a Star Wars novel and to be so well done on top of it all. Chuck Wendig delivers and excellent bridge from the old Return of the Jedi to the Force Awakens. The characters are given a depth that is greatly appreciated and still captures all the tropes that one wants from a Star Wars novel. For once, I feel like I am the target audience for a Star Wars product in ever sense of the word. Four bear paws out of four for Chuck Wendig’s Star Wars: Aftermath. A definite must read for a fan of Star Wars. 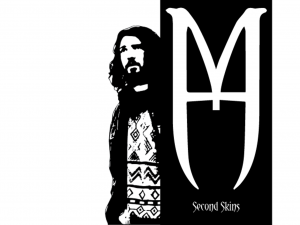 One of the great games I had the pleasure of playing in while at Big Bad Con 2015 was Monsterhearts. I had learned about the game back in 2013. The idea of playing teenage monsters much in the same vein as Buffy and Angel was intriguing to me. I am a big fan of vampires and werewolves so this was a natural fit for me. I had heard of Apocalypse World but had never played it so the system itself was an enigma that I had not cracked when I picked up Monsterhearts in the vendor hall at Gen con that year. I took the book home with me and read it cover to cover and was very excited by the types of stories that this game presented. Monsterhearts makes excellent use of the Apocalypse World system. It is an elegant system in which players chose a playbook that represents their character in the game. 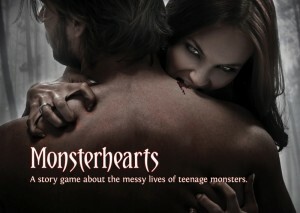 In Monsterhearts, some of these playbooks are, The Mortal, The Beast, The Queen, and The Sasquatch. Each playbook present the player with a series of seemingly simple choices. These range from name, look, ability scores, and special moves. As the player progresses through these choices, they are creating the layers that are going to form their character. They are defining how they are going to interact with the world. The systems has for stats; Hot, Cold, Volatile, and Dark. Each is given a rating ranging from -2 to +2. When a character makes a move, they roll two D6 and add or subtract the appropriate stat and then either succeed, their are complications, or fail. The results of each of these outcomes is listed in the moves description to make the game go smoother. The basic moves that all characters have access conjure up the tropes that are ubiquitous in the teen supernatural genre. The two moves that get mentioned most when talking about Monsterhearts are Turning someone on and Shutting someone down. They are designed to capture those images of the head cheerleader turning on the quarterback to get him to do what he wants or the hard goth putting down this same cheerleader with the ugly truth of a situation. Each playbook has special moves to better capture the particular feel of the monster you are playing. In the game I played, I was the Sasquatch. The Sasquatch is a timid creature that hides from confrontation but has the ability to be built in such a fashion as to be very violent as well. I chose this option. One of my moves was Disappear. This allowed me to simply go invisible if I ran away successfully. I used this move to good effect throughout the game until it failed in a spectacular manner and unleashed my inner darkness and violence. 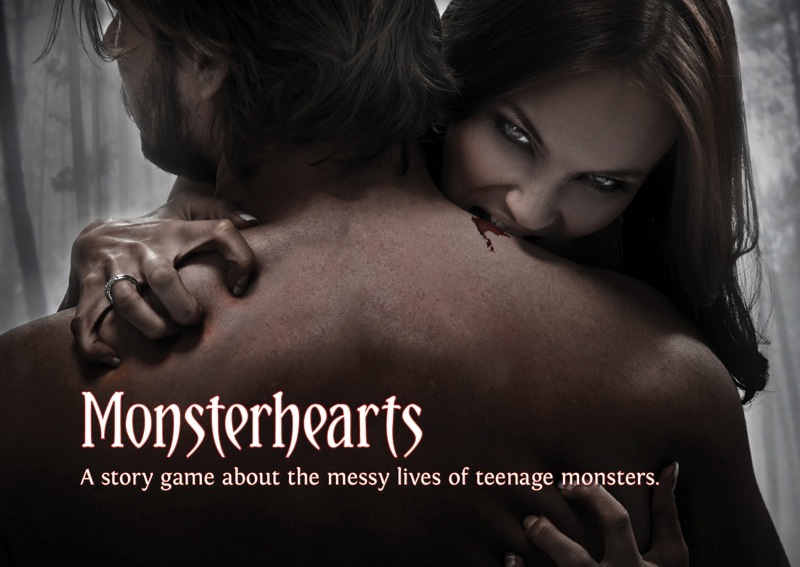 Monsterhearts is a game about teenage monsters that does an excellent job of making you look at what it means to be human and a teenager. It takes all those things that were both glorious and awful about this time in life and cloaks them in this veil of monstrosity to make them more palatable. In the game I played, issues of bullying, sexual manipulation, responsibility, and consequences all were hit upon and played out in the messiest of fashions. Hell, my choice of the Sasquatch was to play something that didn’t require much a stretch for myself and I ended up pushing myself to explore what it meant to be on that razors edge of needing people and terrified of them at the same time. I would be remiss if I didn’t call out the group that I played with as well. They all were open to playing in this dark world and exploring these themes while being open to direction when something may have went to far or went on to long. They made it easier to explore these ideas at the table. I give Monsterhearts four bear paws out of four. It is an excellent game that is easy to understand, quick to play, and doesn’t gloss over the presence of LGBT characters and the fluidity of sexuality within the rules. It treats the subject matter as worthy of respect and exploration which is a great find in a role playing game. I hope I get to play more Monsterhearts in the future.